Yesterday I found out that my cousin, Lisa, has a tendency to keep the blinds in her house closed when times get tough. Yeah, that’s me too. Until we reunited over my brother’s illness, I did not know that she too battles fibromyalgia and a host of “female,” medical issues. She is at the beginning of her search for treatment options. We talked quite a bit about these and other family matters while sitting in my brother’s private room on the Telemetry floor at the Detroit hospital. And so it goes at weddings, funerals and the markers of life in between: catching up on relationships we are too busy to nourish when busy with the tasks of life . . .
Steve and I got home around midnight after our whirlwind trip to see Mike in the hospital yesterday. (Steve had to work today and I’m allergic to hotel rooms anyways!) I am both depleted and grateful for so much today. Steve drove us the 6-hours round trip so we could see Lisa, Mike, and his fiancé (Lisa) while I endured seizure attack episodes in the car. Our departure was a few hours late due to the same. Divine timing superseded it all as we were able to see a physician familiar with Mike’s care during her evening rounds and before we had to leave. As of today he has been cleared of any infectious disease cause to the right CVA; he continues nothing-by-mouth yet is getting his “Pepsi” substitute via IV glucose. Pepsi is all he kept asking for . . . in addition to asking his fiancé to wish me a “happy birthday.” Yes, I got to see my brother for the first time in years yesterday and on my birthday. Strange but true. Today I am back in cave-dweller mode. The grief reaction of seeing him so debilitated is taking its toll so I am just lying low for now. I tried out a new ceramic frying pan to make my Candida diet/mold-free/low oxalate blueberry pancakes and kept the beast of a skillet on the stove long enough to make lunch this afternoon too. Perhaps I will shower before my husband comes home this evening and perhaps not. The extra (stress?) seizure attacks and post-travel fatigue probably contributed to me missing the very chiropractic treatment I needed to relieve my sore back. Oh well. The Lord has given me the time and space I need to clear my head from the events of this week and that is good. Catching up with other relatives today while sharing the news about my brother is good too. My relationship to one cave dweller in particular is making a difference right now. So poetic that all of this is happening in my life during the week that the world celebrates Easter. 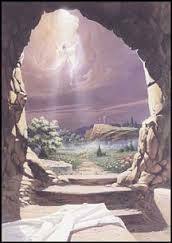 Our Lord, Jesus Christ lain in state in a cave after dying a tortuous death on a cross for the sins of me and you. We can point to Easter Sunday with hope that the suffering of our lives (the consequence of living in a fallen, sin-laden world) will be redeemed when He comes again in glory. He who has victory over death both knows the cries of our hearts and holds them in the palm of His hand that reaches out to us in grace, in mercy, in love. He is with me here now and goes before me no matter what the next moment may bring for me or Mike. I am strong in this belief despite the weakness of my broken frame. Nothing can take this away for those in Christ. Nothing! So if you are feeling weak, vulnerable, fearful, doubtful, or sad this day: take heart. The Lord is on the throne of grace and weeps for our suffering. He will come again in glory and make all things new someday. In the meantime I hope that you will reach out to Him and let me know how it goes. We all can be brought into the light of His amazing grace to dwell in His presence if we but believe. Where does your heart dwell Gentle Reader?